Beach party decorations are fun and easy to find (in the summer). 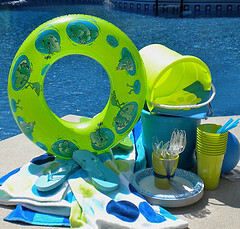 Items like beach towels, beach pails and sand toys make the perfect party decorations. Many party hosts struggle with pool party decorations - and that's because they don't have a theme. Make it more than a pool party - make it a "Ball at the Miller's Beach." 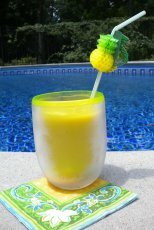 Let your guests know that they are entering the "beach party zone" by decorating the pool gate. 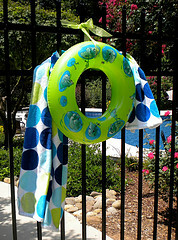 Hang a colorful beach towel and pool float on the gate. Spend the money and get a new beach towel that has vivid, bright colors. 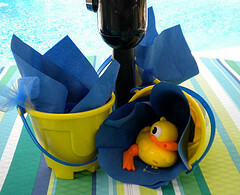 Or use a bright colored beach hat or beach bag with a towel hanging from the side. Scatter some sea shells on the sidewalk leading to the pool. If you have a beach umbrella or beach chair place it on the ground near the gate. 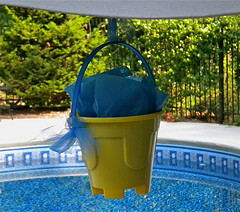 Don't forget to decorate the pool with floating pool decorations. What could be better than a bunch of beach balls floating across the top of the water. It's best to get at least 12" size balls and for large pools, get 24" size. 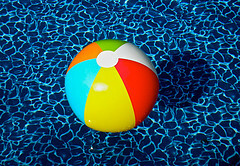 Beach balls range in size from 6" to 48". 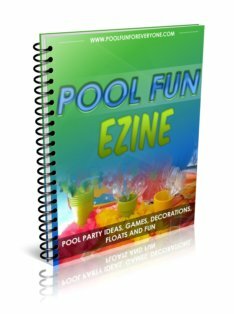 Not only do they make great pool party decorations, but are fun to play with no matter what age your guests are. Hanging paper lanterns make great pool party decorations. 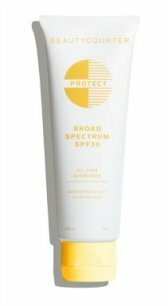 They can be found at dollar stores, Pier One, and on-line. Hang them from tree branches or our favorite is to hang them from the patio umbrella ribs. Use an assortment of colors or ones that are consistent with your color theme. 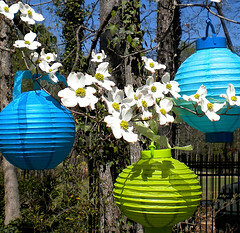 Paper Lanterns, Parasols, Party Lighting and more, plus FREE SHIPPING on orders over $99 at PaperLanternStore - SHOP NOW! Colored Beach Pails and Shovels can be used on the table for beach party decorations. I love how they help to hide the patio umbrella pole. Use three small ones placed at different angles. A little tissue paper and a beach toy complete the decor. Other decorating ideas for the table are to use new sand toys, shovels, and sea shells. You can also use the sand buckets to hold the napkins and silverware. 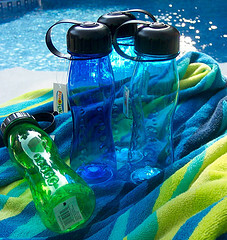 Instead of cups serve your beverages in blue plastic water bottles. Keep the tags on them to write the guests name. That way everyone knows which water bottle is there's. Or get this set from Amazon - each bottle has a different design and they are BPA free and dishwasher safe. They can serve as take home party favors as well. Hang these beach ball shaped paper lanterns from your umbrella ribs. The set comes with 3 paper lanterns that are 9.5" wide. The bright colors have the appearance of beach balls and will bring bursts of color to your party. Place beach party decorations high and low. We love to have something hanging from the patio umbrella ribs - it can be paper lanterns or these cute plastic beach pails. You can also hang mini-beach balls. Prop blown up colorful air mattresses next to the pool gate or in a corner of the pool area with a bright beach towel draped over it. Borrow a beach umbrella and place it in the ground near the swimming pool with a beach chair under it. Place a striped beach towel over the chair arms along with a large beach pail and shovel sitting next to the chair. Place an inflatable surf board at the entrance to the pool or party or by the party table. Bright colors of blue and orange and a great size 71" x 30" and that's deflated. Of course move it to the swimming pool for beach party games. For an evening beach party, be sure to include some pool party lights. 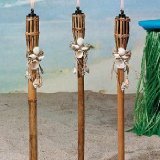 Inexpensive bamboo tiki torches can be found at your local home improvement store or grocery store. Line the perimeter of the pool with these outdoor torches and place them along dark pathways or steps. Be sure to never leave them unattended. Use citronella oil to help keep away the bugs.